Dr.Swapna Rani Bade completed her MBBS from NTR University of health sciences. 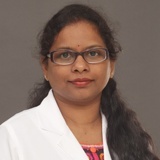 Dr. Swapna worked as Duty Medical Officer in Kala Hospital, Vizag, Andhra Pradesh for two years and later worked as ER physician in Almana hospital, Jubail, K.S.A. before returning to India to work as General Practitioner and Duty Medical Officer at Purna Clinic, Vizag, Andhra Pradesh. She can converse with her patients in English, Arabic, Hindi, Telugu.